Rich and tender beef, SO many veggies... This is the way to do pot roast RIGHT. Second helpings are encouraged! Bring a large skillet sprayed with nonstick spray to high heat. Season roast with 1/4 tsp. each salt and pepper. Cook and rotate until all sides are browned, about 5 minutes. Place in a slow cooker. Add all remaining ingredients except cornstarch to the slow cooker, including the remaining 3/4 tsp. each salt and black pepper. Gently stir. Cook on high for 3 - 4 hours or on low for 7 - 8 hours, until roast is cooked through. Turn off slow cooker. In a small bowl, dissolve cornstarch in 2 tbsp. cold water. Stir into the liquid in the slow cooker. Let sit, uncovered, until slightly thickened, about 5 minutes. Remove and discard thyme sprigs. 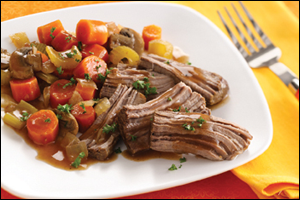 Slice meat and serve topped with veggies and sauce! HG Tip! If the roast breaks into pieces when you trim away the fat, just cook each piece in the skillet until browned -- the smaller pieces will take less time. Tongs are great for rotating the meat when browning.